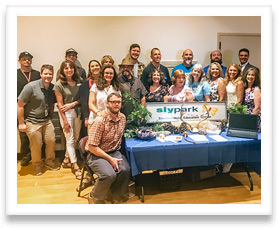 Members of our Sly Park staff. Raven and her side kick, Phoebe the therapy dog, love working at Sly Park. Raven has been teaching outdoor education since the 1980s. She attended outdoor school as a 6th grader and it changed her life. In the 1970s she was a High School Counselor at Sly Park. While in college Raven discovered she could work in outdoor education as a career and she was thrilled! She has a Bachelor of Arts in Liberal Studies, a minor in Anthropology, and a teaching credential. Raven's specialties are storytelling, Native American studies and ethnobotany, to name a few. Phoebe the therapy dog began working at Sly Park in 2012. Phoebe enjoys bringing smiles to students and adults alike. She helps with homesickness, reducing stress and anxiety in students and so much more. Ginger has been a Sly Park Teacher for 14 years. While receiving a B.A. in Liberal Studies Ginger was a trip leader for Adventure Outings. She helped lead mountaineering, rock climbing, backpacking, and rafting trips throughout California. In college she spent three years teaching Environmental Science in the classroom. After receiving her teaching credential Ginger taught 6th and 8th grade science for five years at Markham Middle School. She also has had her Wilderness EMT since 1996. Suzanne brings years of teaching and outdoor experience to Sly Park. Suzanne is the latest credentialed teacher to add to the Sly Park staff of regular teachers. She has worked for National Outdoor Leadership School (NOLS) in Alaska. Her bilingual skills help translate the science and wonder of the forest to a diverse student population. Todd is a full-time credentialed teacher with 14+ years of experience at Sly Park. Todd has lived in the Sly Park area for 30+ years. His background in Watershed Science and Natural Resources compliments his teaching style. When not at Sly Park, Todd can be found fly fishing the streams on the West Slope. His favorite ice cream is Pistachio. Gio Giordano comes to Sly Park with an extensive background as a wildlife biologist, filmmaker and informal science educator. He has participated in research projects on a variety of terrestrial and marine animals throughout the United States and South America. Gio has taught at several outdoor science schools and presented science activities at hundreds of California public schools through the Lawrence Hall of Science Outreach Department. In addition, the BBC, National Geographic, and numerous environmental organizations have used his wildlife photographs and videos. David was born in Los Angeles. At an early age he was drawn to nature and science. He graduated from University of California, Santa Barbara with a major in Geography and additional course work in Geology and Environmental Studies. He began teaching at Sly Park in 1991. He has performed educational leadership roles as a PAR teacher and as a BTSA support provider. David also has had training in ropes courses (Project Adventure Advance Skills) and wilderness medicine (WFR). He is an avid rock climber, backpacker and mountain biker. Austin is from Northern California where his interest in the outdoors began as child in Butte County. He attended UC Berkeley and received a B.S. in Environmental Sciences and minor in Forestry and Natural Resources. After working in the field of natural resource management throughout California and out of state, he began work as a naturalist at the Coloma Outdoor Discovery School. He later returned to Butte County, where he received his teaching credential and M.A. in Education from Chico State. Austin now works to blend his diverse management and field science backgrounds to teaching at Sly Park.